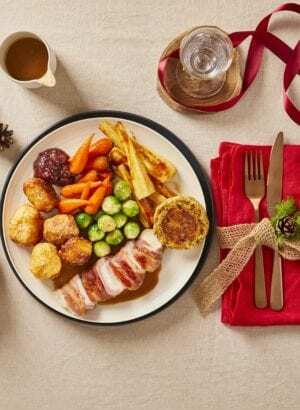 Cooking up a cracking Christmas Dinner takes great ingredients, foolproof recipes, and sometimes, a bit of practice. 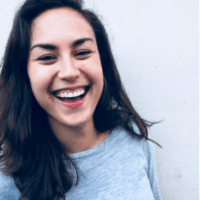 There’s plenty to think about: from family favourites to annual opinion dividers. 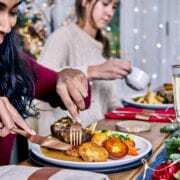 Our Taste of Xmas recipes (on the menu from 6th of November until the end of December) nudge you toward the flavours of Christmas, but can also help you develop helpful skills to prepare for cooking a wonderful dinner come the 25th. 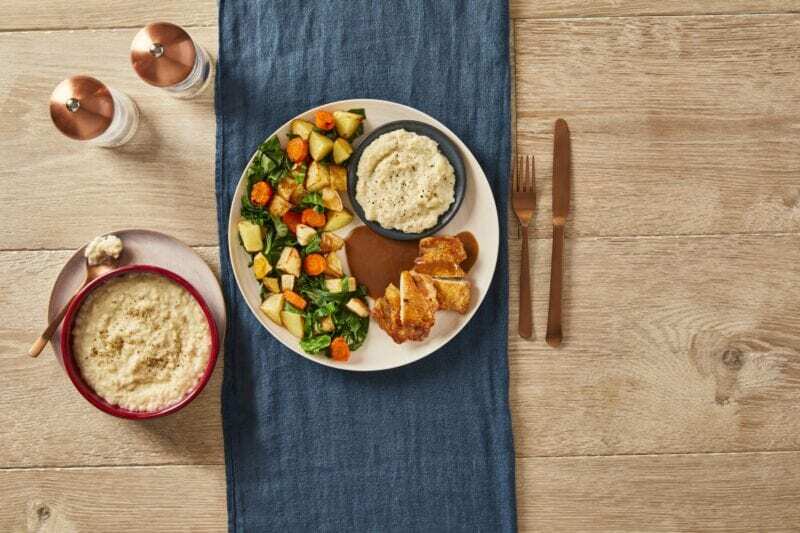 Bread sauce is steeped in food history. Dating back to medieval Britain, its origins can be traced back to when cooks found that adding stale bread to sauce could thicken it. 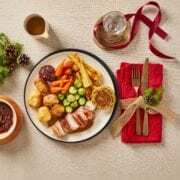 Our Taste of Xmas Crispy Chicken recipe uses Bread Sauce as a delicious accompaniment to the roasted veg that goes alongside. 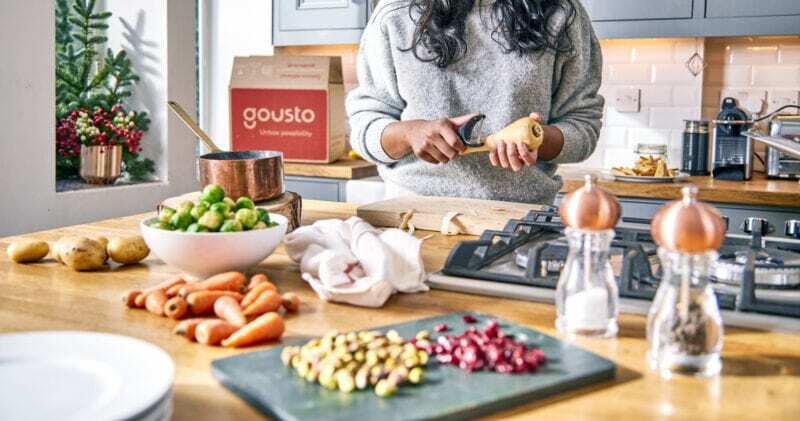 In this recipe, you’ll learn a quick and simple method that uses star anise and bay leaf to bring a special kind of spice to a traditional winter dish. Peel and halve the shallots and peel the garlic. Give everything a good mix up and cook for 1-2 min or until the breadcrumbs have soaked up most of the liquid. Once this step is complete your sauce is done and you’re (b)ready to impress! Some in favour, many against; there’s never been a culinary divider quite like sprouts. How did they end up causing such a stir on the dining table? Bundling onto our plates from Belgium sometime in the late 18th century, these ‘mini cabbages’ are at constant risk of being over boiled. But, with the right amount of TLC, a Brussel Sprout can be a thing of wonder. Practice getting yours just right before the big event with our simple balsamic roasted version. Once done, add the balsamic vinegar to the cooked sprouts and give everything a good mix up – now you’re ready to convert the sprout non-believers! Bright and cheery red cabbage hasn’t long been on our Christmas dinner plates, with some arguing that it’s actually a veg best saved for Boxing Day. It pairs wonderfully with goose or turkey, and its particularly festive appeal (outside of its colour) is how well it holds spice. Loved by both sides of the Atlantic (Danes serve it with pork and it’s a staple on the American Thanksgiving table), our version uses star anise, balsamic and sultanas for the perfect Taste of Xmas side dish. 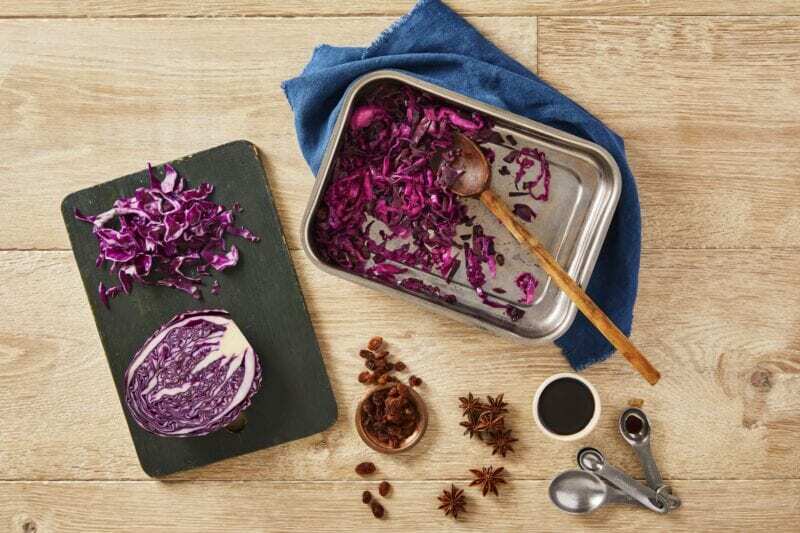 Cut your red cabbage in half and slice as finely as you can! 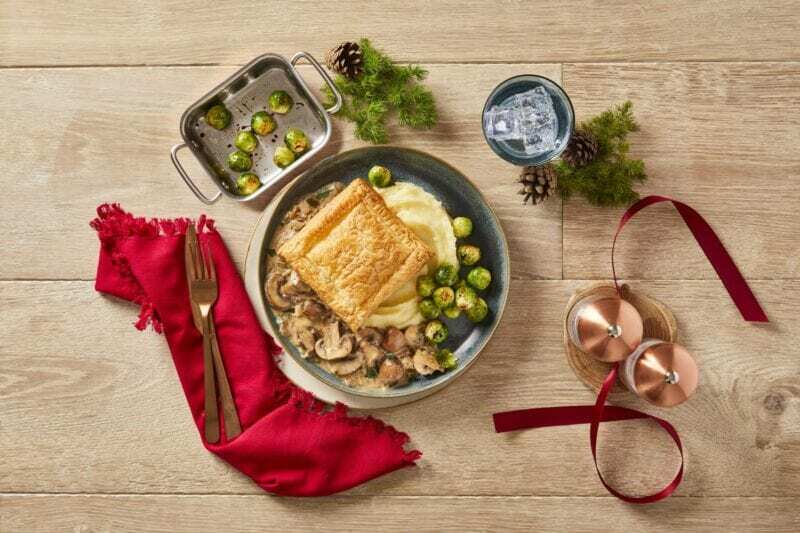 Cover the dish tightly with tin foil (or a matching lid) and put the dish in the oven for 35-40 min or until the cabbage is cooked – serve alongside your favourite festive main. Total hearty comfort in all its forms, stuffing is an absolute roast dinner essential, whether it’s on a cosy Sunday in the pub, or on Christmas Day itself. Traditionally, the idea of stuffing a bird with bread, herbs and spices was to help maintain moisture, as well as infuse flavour. Nowadays stuffing is so popular that we serve it on its own. 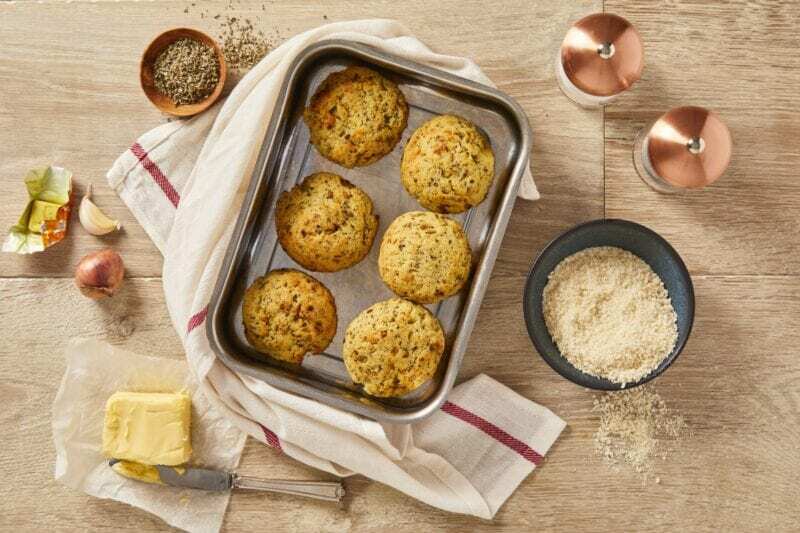 Learning your own recipe from scratch will make you your nan’s favourite grandchild, and the stuffing balls that accompany our Pan-Fried Chicken recipe are a perfect starting point. Add the stuffing balls to a baking tray and put them in the oven for 10-12 min or until they’re browned – once cooled they’re ready for stuffing into your mouth (no judgement it is Christmas after all). Every country where potatoes grow has its own traditions, but around the British dining table, where the potato is king, the steaming roastie is royalty. Piercing its crispy outer and sitting back while heat escapes – knowing what awaits – can be the best part of a roast dinner. But getting that fluffy crunch just right needs practice. Our Swedish Pork Chop With Roast Potatoes & Beans is a meat and two veg dish with a twist. Using flourishes like clotted cream and soy sauce, you’ll get your potatoes roasted to perfection with a technique you can use time and time again. Add the cooked potatoes to a baking tray with a generous drizzle of vegetable oil and season generously with salt. 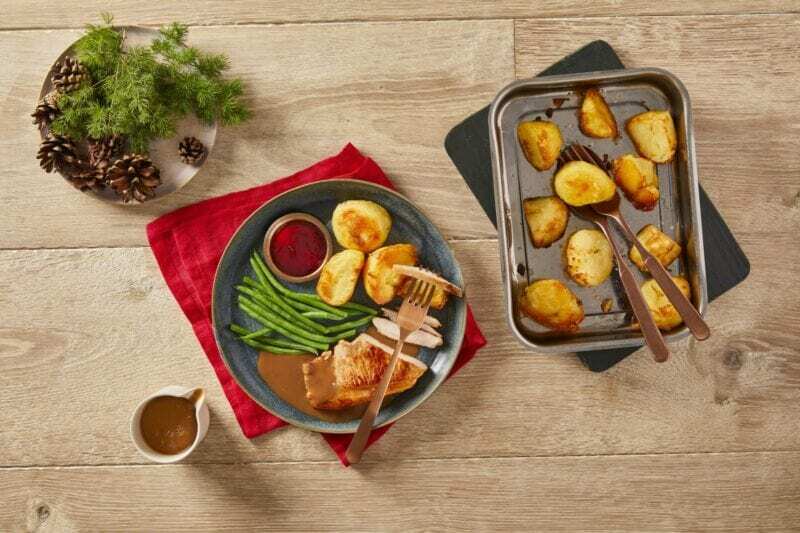 Tip: when you’re roasting in the oven always use oils with a high smoke point – such as vegetable oil – these will burn less easily and give your food a better flavour and final result. Olive oil has a lower smoke point than vegetable oil, so it’s not the best option for roasting. Put the tray in the oven for 10-15 minutes and then turn the potatoes in the oil. Return to the oven for a further 10-15 min, or until they’ve reached your desired level of golden crispy goodness. Allow to cool slightly, but serve while still hot from the oven. Do you prefer your cranberry sauce sweet or sour? If it’s the tart tang of berry that tickles your fancy, perhaps you’ve spent winters in Europe. If it’s something sweeter, then you’ll have probably come across the pre-mixed version, popularised in the States. 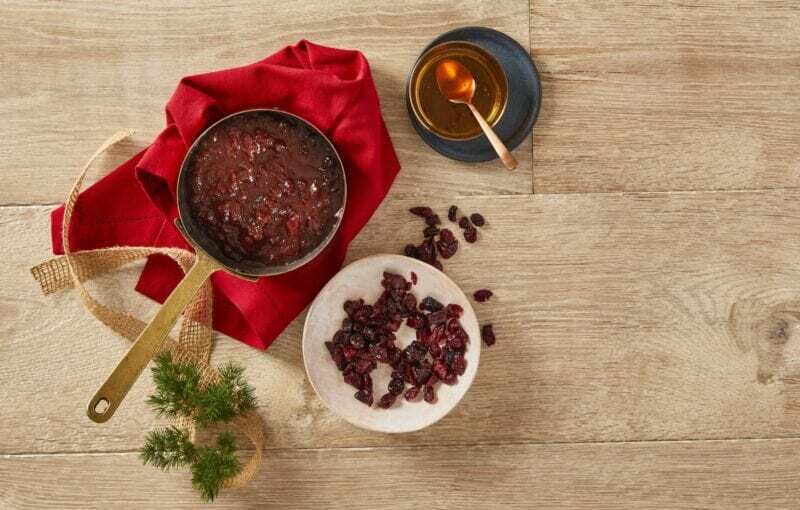 Our simple version uses dried cranberries and honey to create a wonderful homemade sauce that’ll work brilliantly with all your favourite Christmas classics. Once mastered, you can take sweetness up and down to your liking. 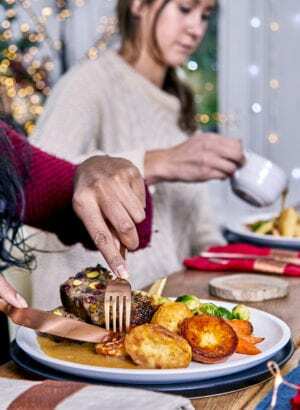 With Christmas fast approaching, what culinary tips have you got up your sleeve? Share them with us below!